Coco Rico: Somewhat disappointing. I've had another coconut soda before which had a chemical taste, and this thankfully doesn't, but it's a little on the light side in flavor. A bit more punch would help. The flavor that is there is a nice, fresh coconut flavor, not toasted or cooked. This isn't what you'd use to make a pina colada -- not enough of that coconut or sweetness. It might go well with a tropical fruit vodka, though. Royal Tru-Orange: Pretty darn good, but not worth the $1.29 versus Fanta or Crush (even with the added B Vitamins). Orange flavor is definitely more natural than the big boys, due to the 10% juice, and has a good deal of orange peel fragrance. Less fizzy than Sunkist. WIT beverages has unveiled Jelly Belly Gourmet Soda, which comes in nine flavors at NACS, Beverage Network reported. 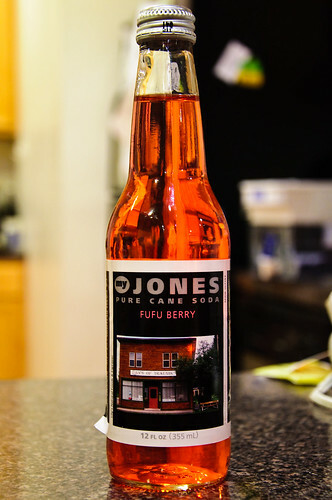 The company said that the soda is made with cane sugar and contains 90calories per bottle. It comes in four packs of 6.3 oz glass bottles. In addition, the four-pack container is made from recycled cardboard, 35% of which is from post consumer waste. The soda is available in various flavors such as Lemon Drop, Sour Cherry, Blueberry, Green Apple, Crushed Pineapple, Tangerine, Juicy Pear, Strawberry, and Very Cherry flavors. This is from the same manufacturer as the Caruso's Legacy sodas, including the Maraschino Cherry reviewed upthread and the sodas at Aldi mentioned elsewhere on the site. 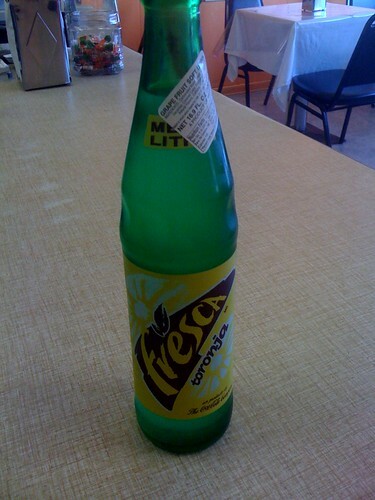 but is Fresca Toronja commonly found around Chicago? I don't think I've ever seen it here. Where did you find it and how was it? I'm not a big fan of the Jarritos toronja, but I'm guessing the Fresca is a notch or two above it. Birrieria Zaragoza. They just recently started carrying Fresca Toronja and were quite enthusiastic about it. BTW, thanks for starting and continually adding info to this sensational thread. One of my all-time LTH favorites. That's saying a lot this I basically dislike sodas. In fact, my #1 place to visit while in LA this coming March is a visit to Galco’s Soda Pop Stop. Thanks for turning me on to it here. I'm curious about Fresca Toronja? Is it cloudy with bits of citrus pulp in it? gleam wrote: I don't think I've ever seen it here. Hard to tell if it was cloudy because of the green bottle. I didn't notice any pulp (but pulp can move, baby). In the Supermercado Morelia thread d4v3 wrote: I ended up buying a Fanta, 7-Up and a Fresca. You can see bottles of Mexican Fresca a little below and to the right of center. Thanks! It is something I will keep an eye out for. I have little hope to have the Fresca of my youth, which was a cloudy grapefruit drink with bits of pulp. It's something I wonder if I would still like today. Remarkably good. Tart. Sweet. Fruity. Essentially a carbonated version of cranberry juice cocktail. It's Meijer's house brand, so it's cheap, too. (Sorry, city dwellers, it's only available at Meijer stores.) It comes in cans and 2-liter bottles. If you like your drinks a little less sweet you can thin it down with seltzer, just like regular cranberry juice. I expect it would make a good mixer. As much as I love America's Market, I don't think any store in the US or world comes close to what Galco's offers in terms of selection. John Nese of Galco's was interviewed for today's edition of The Story -- the interview starts about 60% of the way through the program (click download or Listen Now at the bottom of the post). In Los Angles a couple weeks ago, we had a chance to visit Galco's and to meet the owner, John Nese (be sure to watch the Youtube video if you haven't already). Interesting store, interesting guy, that's for sure. I believe that's his DeLorean parked outside. Inside, it's aisles and aisles of sodas I never heard of, almost all of them sweetened with real sugar and bottled in glass. I was very impressed and, coming from someone who probably doesn't drink more than 4 or 5 standard sodas a year, that's really saying something. There's also a pretty good selection of regional candy bars from small producers as well as a respectable beer department. Here are some of the sodas I bought. All I can say so far is the Waialua Kona Red (made with real coffee cherries according to the label) is nothing special at all. If you enjoy cherry cough drops you'll probably like this one. I wasn't very impressed with the Manhattan Special orange either—much too sweet and intensely flavored, reminiscent of triple strength Tang. On the other hand, the Hotlips sodas are truly special, maybe the best soft drinks I've ever had. I haven't opened the blackberry shown above but samples of their raspberry (intense berry flavor, lots of pulp, not too sweet) and pear sodas (much more subtle, beautiful spicy flavors) were extraordinary. 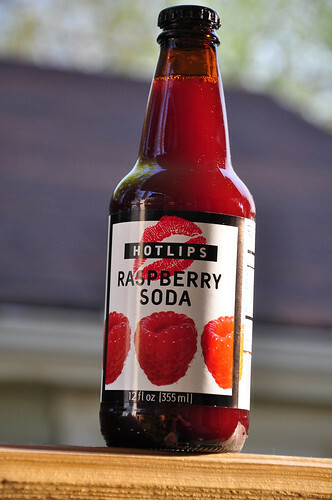 Has anyone seen Hotlips sodas (from Portland OR) in Chicago? Gleam, you must visit Galco's (but I'm sure you realize that already). This is a soda I had in Bombay at Brittania restaurant, a famous Parsi place. It has the most powerful ginger flavor I have ever had in a soda but is remarkably well balanced. It is amazing. I doubt you can find it outside India (maybe Iran?) but if anyone knows where I can get this let me know! A Moxie sighting! Like Dr. Pepper with a touch of insecticide. Rene G wrote: All I can say so far is the Waialua Kona Red (made with real coffee cherries according to the label) is nothing special at all. If you enjoy cherry cough drops you'll probably like this one. 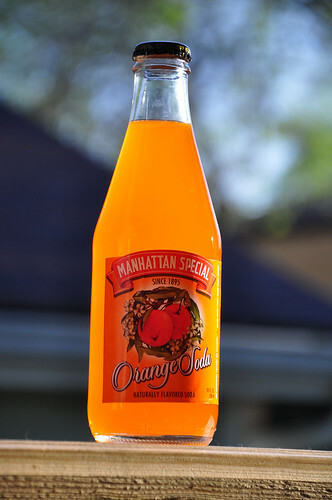 I wasn't very impressed with the Manhattan Special orange either--much too sweet and intensely flavored, reminiscent of triple strength Tang. 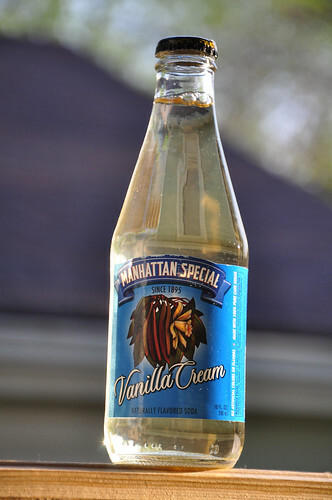 Have you tried the Manhattan Special coffee soda yet? I was really impressed by it.. usually the more novelty sodas are terrible, but I thought this one tasted like decent iced coffee with a bit of carbonation. Habibi wrote: This is a soda I had in Bombay at Brittania restaurant, a famous Parsi place. It has the most powerful ginger flavor I have ever had in a soda but is remarkably well balanced. It is amazing. Galco's has a remarkably good selection of ginger sodas but I don't think there's any Pallonji's. It sounds good and I'll keep my eyes open (you never know). Is it made in India or Iran? Strong ginger sodas are among the few sweet soft drinks I enjoy. teatpuller wrote: A Moxie sighting! Like Dr. Pepper with a touch of insecticide. I've wanted to try Moxie for a long time. I'm just waiting for the proper time. 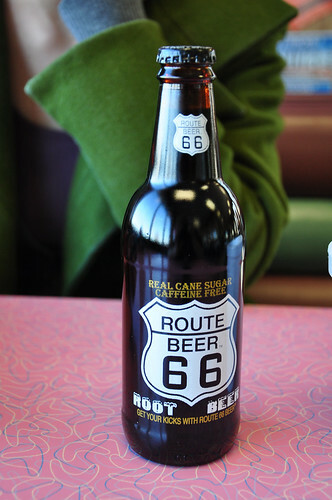 Seriously, if you're ever near the Quad Cities (or Portland) these sodas are worth a detour. Hotlips seems to be working at an entirely different level than other pop makers (admitedly my soda experience is very limited). The amount of real fruit in each bottle is amazing; I notice a bottle of the blackberry soda gives you 7% of your daily fiber! I haven't tried the coffee soda yet but, based on my experience with their orange and sarsaparilla, I worry it will sweeter than I like. I'll try to keep an open mind. I'm also looking forward to trying the vanilla. For some reason I don't think excessive sweetness will bother me as much with that one (I used to love cream soda as a child). Awesome stuff. Like drinking lightly carbonated pureed raspberries. You can see it's a cloudy drink... there are also small raspberry seeds in it, further reminder that this isn't a normal soda. Izze:Hotlips :: Five Guys:Edzo's. A. Funny you should mention Izze raspberry - I bought some of their "Izze-esque" (who came up with that name - really?) black raspberry and liked it OK - it's still a bit too sweet and heavy for me, but less so than their regular sodas; I wish they would stop using apple juice concentrate and thinking it is different than sugar. Found what I'd been looking for: Klarbrunn raspberry-flavored sparkling water. A nice, light, raspberry flavor in a sparkling water, slightly sweet but not at all cloying - has the added benefit of being calorie-free without added sweeteners of any kind except the raspberry. It reminded me of how you get lime water by adding a slice of lime - just enough to flavor. Marketplace on Oakton is carrying 12-pack cans in several flavors. while picking up some bundaberg ginger beer at cost plus (B+/A-, a very smooth and light ginger beer for those that tend that way) I also grabbed some bundaberg Peachee. Unlike most fruit sodas, this one starts with a peach mash involving yeast and is actually brewed. It's an extremely peachy soda, and it's truly delightful. $6 for a four pack at Cost Plus World Market (I got mine on the one in Lincoln Park by Binny's/Whole Foods/etc). A full-throated A from me, and I have to imagine it would make an excellent mixer. Noticed that this awesome thread had slipped to the second page, which is just wrong. Wanted to weigh in with an important scientific finding: Not only is Jarritos mango soda delicious, but a 20-ounce bottle gets you 10 percent of your RDA of vitamin A and 15 percent of vitamin C.
You owe it to your health to consume one regularly. I can report that a keg of root beer remains delicious for at least 5 days, although it does seem to rapidly lose its carbonation. It's still lightly carbonated, but nothing approaching what it was like at the picnic. Other discovery: You can buy dublin dr pepper syrup in bag-in-box form from olddocs.com. My wife and I are already putting "home soda fountain" on our 5 year plan. Gleam...you are obsessed! Love it. Safeway/Dominick's new Refreshe flavors include a fairly nice grapefruit. Like the Refreshe ginger ale, it's somewhat delicately flavored, but I liked it -- the lighter flavor works better with grapefruit -- just don't expect an aggressive flavor like Squirt's. Unlike many citrus-flavored sodas, it doesn't seem to contain ester of wood rosin. So far I've tried this grapefruit; the tonic water, which is the same as the old Safeway tonic, and as good as any national brand; the ginger ale, which is just OK; and the seltzer, which is insufficiently carbonated and goes flat very quickly. Complete list of flavors. If you want to try it free, this link should open a Facebook page with an ad in the right sidebar. Click where it says "Get a free Refreshe" for a popup that will let you sign up to be sent a coupon. However, it's cheap as sodapop goes. Right now it's on sale for $2.50 per 12 pack or buy three for $1.79 each. Just curious, why do you care if ester of wood rosin is in a drink? I've never heard of any health problems associated with them, and I don't drink enough citrus drinks to know if it imparts an off flavor, but it mostly seems to be used to keep citrus oils suspended in the soda..
gleam wrote: Just curious, why do you care if ester of wood rosin is in a drink? I've never heard of any health problems associated with them, and I don't drink enough citrus drinks to know if it imparts an off flavor, but it mostly seems to be used to keep citrus oils suspended in the soda. I don't care -- I just thought that might be part of the explanation for the lighter flavor. Fox and Obel has six varieties of Fentimans sodas: the Curiosity Cola, Ginger Beer, Shandy, Seville Orange, Dandelion and Burdock, and Victorian Lemonade. $4 each. They also have three varieties of Ginger Beer "by Bruce Cost", who is one of the cofounders of Big Bowl. Regular, jasmine, and pomegranate/hibiscus. $3 each. At some point soon I hope to get back into the swing of things with this thread. I still have several obscure sodas from Galco's to taste, a few Asian obscurities, and the fentimans/bruce cost ginger beers mentioned above.